Mary Kay Shanley: How you lived will be important information for those who follow. Phil Roberts photo. 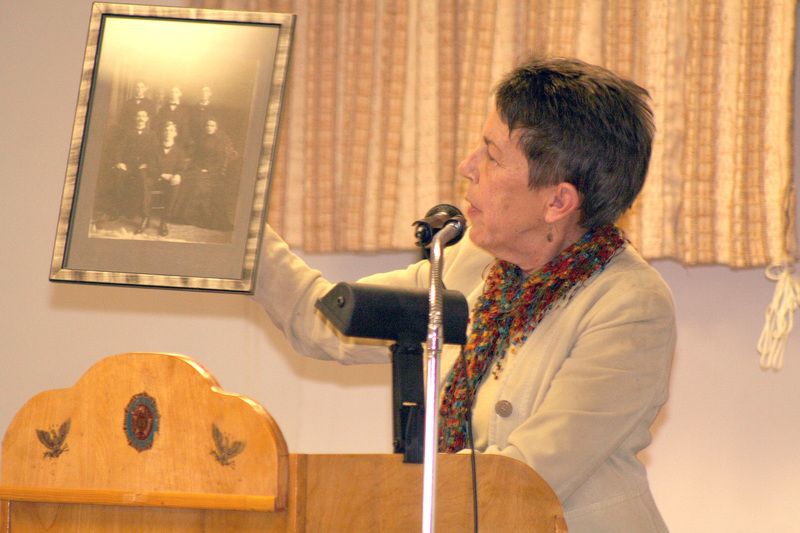 Mary Kay Shanley holds a family portrait of her grandmother and others. She says little is known about her grandmother's life. Phil Roberts photo. 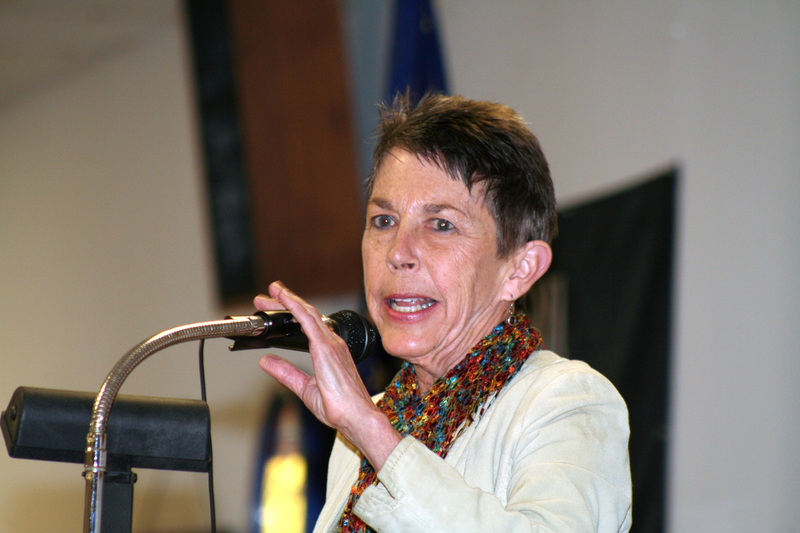 Mary Kay Shanley's topic stirred lots of interest. Phil Roberts photo. Tell your life’s story. Future generations will be interested in knowing how you lived. 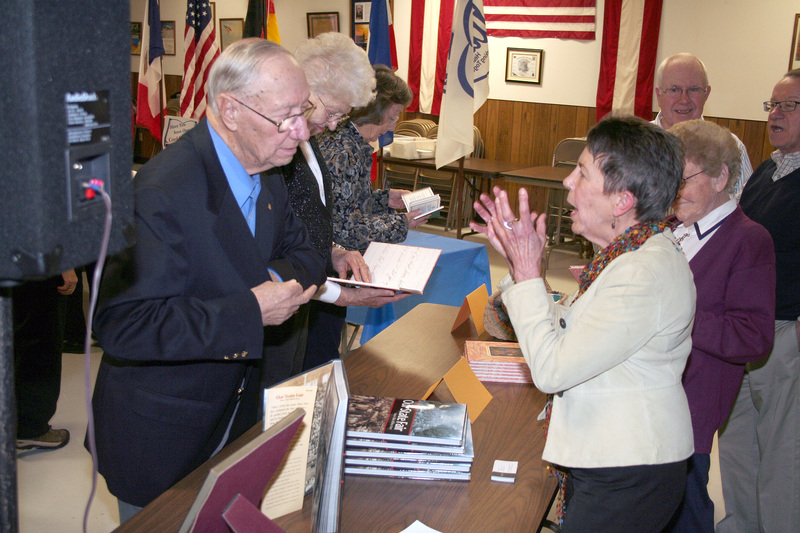 That was the message from West Des Moines author Mary Kay Shanley, the guest speaker on Feb. 19 at a quarterly meeting of the American/Schleswig-Holstein Heritage Society (ASHHS), a worldwide organization based in Walcott. One of ASHHS’ objectives is the study of family genealogy and the preservation of family history, noted the group’s program chairman, Dean Rohweder, in his introduction of Shanley. Shanley, a former Des Moines Register reporter and the author of many books, including “The Memory Box: Gathering the Keepsakes of the Heart,” began her presentation by describing what can happen when life stories aren’t preserved. Shanley held up a group portrait of a young woman — her late grandmother, Mary — and five young men, Mary’s brothers, all born in the 1870s. Mary wed Patrick Shanley, and they had two sons, one of whom was Mary Kay Shanley’s father. But in 1916, Patrick, an accountant for a railroad in Minneapolis, died of a heart attack. His wife, who had little formal education and no money, moved with her two young children to Webster City, Iowa, to be near one of her brothers, who lived nearby. She earned money by ironing shirts and baking bread. “That’s how she kept her family together,” Shanley said. Shanley said that’s basically all she knows about her grandmother. When Shanley did become interested in her grandmother’s story, there was no one still living to question. “So there is nobody I can ask. Mary’s life is all gone,” lamented Shanley. “For all of you in this room, you have relatives for two or three generations back who would have said to you (had you asked), ‘Oh, I don’t have a story to tell. I didn’t do anything. I just lived a common, routine, everyday life.’ We know they didn’t. Future generations are likely to look back at us, she continued, and want to know more about the lives we led. Shanley noted, for example, that many in the ASHHS audience were alive before television had been invented. “We lived a life they’ll never know,” she said of those who have always had TV in their lives. “Everybody has a memory box full of all of our memories, and we take it with us wherever we go,” Shanley said. Most memories, she noted, started out as very small, very insignificant events that, if nurtured, became precious memories that now need to be passed along. 1) Share your memories in the form of stories to your grandchildren. 2) Share your memories in letters – as opposed to easily deleted e-mails — to your children. 3) Interview people in your family for additional information. 4) Let someone interview you, then transcribe that interview. 5) Write down your memories. Shanley said you don’t have to be a professional writer to do that. “Good writers write like they speak. You just tell the story on paper. At the urging of some our children, my wife and I have been writing down our memories as they’ve occurred to us for several years. Lack of information about our ancestors in the study of our genealogy has reaffirmed how important one’s memories might someday be to other family members. After hearing Shanley’s words, we’re now documenting our memories with renewed enthusiasm. Copyright 2012 by Phil Roberts, Creative Enterprises. This ran as an “Everyday People” column in The North Scott Press.